We run various climbing sessions which can be tailored to meet your individual or group needs. These courses are held mainly in the Peak District. The following are examples of the courses that we run. INTRO TO ROCK CLIMBING – if you’re new to the sport and looking for a taster session we will cover equipment, safety, basic rope work, etiquette and climbing styles. Dependent on weather, this will be either indoors or out. INDOOR TO OUTDOOR CLIMBING – completing the transition from indoor to outdoor; covering all of the themes of the introduction course and including translating guide books, anchors, access issues and more technical climbing instruction – working on your technique. We can be flexible to cater for your needs offering courses mid week, weekends and groups (discounts available). Please contact us with your requirements. Utilising various sites in the Peak District; we can offer instruction on Abseiling. Should it be a refresher before a trip to Utah or as a stag / hen do, we will ensure that you have an enjoyable day, learning different skills from equipment selection, safety, abseiling techniques, rope work and anchors. 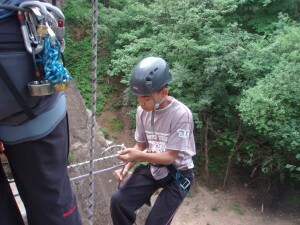 Abseiling can be arranged as a package with a climbing session at no extra charge.